Fuel economy is definitely something to consider nowadays, when prices seem to go up every day. Gone are the days of the 99 cents a gallon. With vehicles that consume seven to eight miles to a gallon, you might be in for a nasty surprise in terms of the money you spent on your vacation. The more expensive the fuel and the higher the consumption of your RV, the less likely you are to be inclined to choose a route that takes you very far from home. However, that would mean missing out on a huge number of attractions. After performing a thorough research, we’ve found that there are several simple ways one can use to improve the fuel economy of an RV. It really does not matter if you are towing a trailer or driving a motor home. The fact of the matter remains that your driving habits can impact the amount of money you’ll be spending on fuel. Believe it or not, the kind of RV you end up choosing, whether it is a rental or your own, certainly has a say when it comes to fuel economy. The rule is simple, in this case, as the heavier the vehicle, the higher the fuel consumption. For instance, a medium-sized camping trailer might in the end require less fuel compared to a heavy RV. If you have the possibility and find that you are not bothered by a lack of space or the absence of too many facilities, you might want to go for a lightweight alternative. Think of it this way: the more luxurious the RV, the more it’s going to cost you. Correlating the weight of the vehicle to the surface it offers is yet another method of realizing just how much damage on your budget it can do. Travel trailers are the thirstiest vehicles in the line. However, there have been made some improvements in the last years in this sense. Some manufacturing brands have upped the game and have eventually created trailers made with fiberglass. Typical travel trailers are more wind-resistant compared to their fiberglass counterparts, but they need more fuel. On the other hand, fiberglass trailers take the cake when it comes to economy, but they are overall less reliable compared to the first ones we have mentioned. Van conversions perform well under various conditions and have a somewhat reasonable fuel consumption. It is actually common knowledge that the higher the speed, the lower the fuel efficiency. With any vehicle, the optimal speed is somewhere around 55 to 60 mph. Once you’re past this speed, you start wasting gas and money. For example, it is estimated that once you go over 75 mph, your vehicle will begin being approximately 25 to 28 percent less efficient. The same rule applies in the case of RVs. Speeding can get you tickets and is generally a too expensive practice for most drivers. Furthermore, getting to the campsite faster will probably kill the pleasure of the entire trip. Check if the air filter is clean. Although it might be somewhat difficult to believe, a dirty air filter can take its toll on fuel economy, and sometimes even up to 10 percent. The proper tire pressure can help you lower the fuel consumption by three percent, so be sure to check it before going on the road. 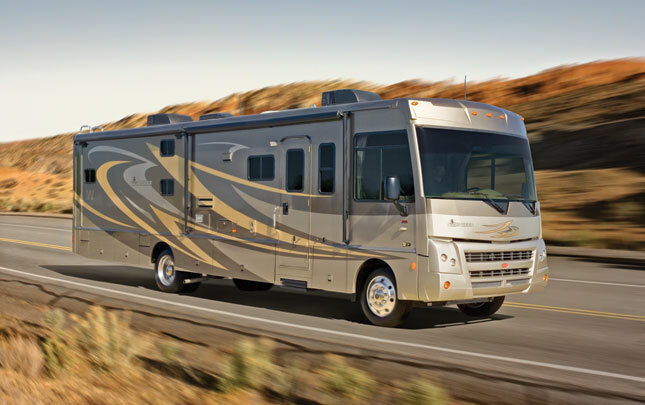 The cruise control should be your friend, because thanks to it you might be able to achieve even higher levels of fuel economy, as it maintains the constant speed of the RV. As previously discussed, try to never go over 60 mph, at least if you can help it. In addition, keeping your vehicle in the best condition is the right way to go about things. Not only will you be able to rest assured that everything is fine, but you’ll benefit from significant fuel economy. To put it simply, if you jump on the road with a poorly tuned engine, you’ll have the unpleasant surprise of wasting more money on gas. Both poor emissions and a faulty oxygen sensor can contribute to the loss in fuel economy by 40%. Even using the right type of motor oil can have a positive impact on fuel consumption. The rules are pretty simple. Don’t expect the best from an RV adventure if you don’t take care of your vehicle and haven’t checked it for a while. Also, if you can refrain from it, try to avoid carrying too much food or too many items that you might just as well never use.